DM Metalloys Pvt. Ltd. is a specialist manufacturer, exporter and supplier of no4 stainless steel sheets in grade 304, 304L, 316, 316L, stainless steel sheets. Polished stainless steel sheets can be supplied in various finishes including NO.4 Finish, Hairline Finish, BA Finish, and No. 8 Mirror Finish with or deprived of PVC coating. 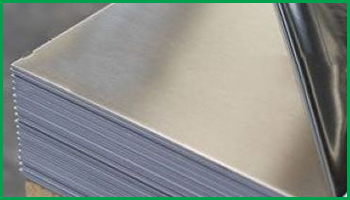 We can supply cut to size NO.4 stainless steel sheets, with both narrow and wide widths. IT is basically produced from 2B finish often by a service center rather than the production mill. It is a general-purpose ground refined finish used widely for kitchen equipment and applications requiring a decorative lavished finish. No.4 finish is usually supplied with a PE covering as a surface protection. DM Metalloys Pvt. Ltd. Supplies Stainless Steel 304/304L/316/316L No.4 Finish Sheets in Faridabad, Gurgaon, Gurugram, Gaziabad, Noida, Lukhnow, Delhi, Delhi NCR, Ludhiana, Amritsar, Chandigarh, Jalandhar, Baddi, Punjab, Uttar Pradesh, Haryana, Mumbai, Pune, Sahibabad, Meerut, Manesar, Bhiwadi, Bawal, Neemrana, SIDCUL, Sonepat, Ambala, Mohali, Panchkula, Kapurthala, Bareli, Kanpur.